Arthritis is a kind of joint disorder which causes chronic inflammation in one or more joints of the body. The literal meaning of the word ‘Arthritis’ -- derived from two Greek words -- is joint (‘artho’) and inflammation (‘itis’). Since Arthritis is a condition which affects the joints (that is, the connections between the bones), Arthritis generally leads to pain, and is often a debilitating disorder. There are more than 100 forms of Arthritis, with Osteoarthritis -- which is a degenerative joint disease -- being the most common form of this disorder. Besides Osteoarthritis, the other common forms of Arthritis are Rheumatoid Arthritis, Psoriatic Arthritis, and related autoimmune diseases. The causes of different forms of Arthritis are different, but the symptoms of the disorders and their treatments are almost the same. Joint pains, meanwhile, refer to a condition in which an individual undergoes a lot of pain due to any damage to the joints, resulting from some kind of injury or disease. 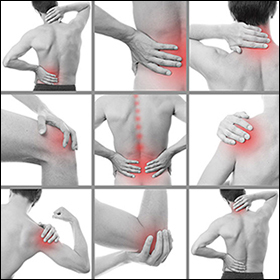 Since joints connect the bones and support the movement of the body, pain in joints can lead to swelling; and can be a mildly irritating condition in short-term, and a debilitating condition in chronic cases. Joint pain can result from several diverse health conditions which can include Osteoarthritis, Rheumatoid Arthritis and Septic arthritis, as well as gout, bursitis, strains, sprains, and other injuries. Although joint pains can affect any part of the body, pain in the knees is the most common form of joint pains, followed by pain in the shoulders and the hips. Overall, Arthritis is a condition in which the sufferers mostly experience pain in the joints, because of inflammation. Arthritis and joint pains have become increasingly more common disorders affecting the aging population all over the world. Both the conditions can cause pain and discomfort to the sufferers and affect their quality of life. 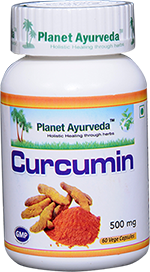 Curcumin is the yellow pigment which is isolated from the rhizomes of the ‘Haridra’ herb (Curcuma longa). The herb is commonly called Turmeric in English, and Haldi in Hindi. Curcumin is the main biologically active phytochemical compound in Turmeric powder. The percentage of Curcumin in the chemical composition of Turmeric is nearly 5 percent. However, for research purposes, the terms Turmeric and Curcumin are usually used interchangeably. 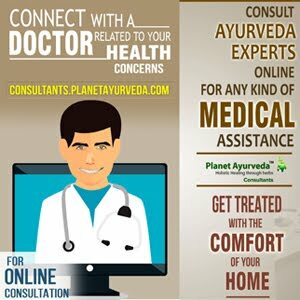 In Ayurveda, the medicinal value of Turmeric/Curcumin has been widely known for centuries. As a result of its anti-inflammatory properties in particular, turmeric has been used in traditional Chinese and Ayurvedic medicines since ancient times. The Curcumin compound in turmeric is very beneficial in fighting excessive inflammation and relieving joint pains. Research has revealed that Curcumin has noteworthy therapeutic outcomes because it is a highly pleiotropic molecule with an exceptional safety profile. The potency of Curcumin in managing several inflammatory diseases and treating joint pains has been proven on the basis of strong molecular evidence which has been published, based on the results of years of research. The therapeutic potential of Curcumin has specifically been highlighted in recent researches which show that Curcumin can be extremely useful in suppressing the excessive inflammation which causes the breaking down of a healthy tissue inside a joint. Specifically in the case of disorders like Osteoarthritis and Rheumatoid Arthritis, Curcumin has been proven to counteract the inflammatory compound COX-2, which is also the target of the prescription drugs for the two conditions. Moreover, along with regulating COX-2, Curcumin also acts on interleukin 1-beta stimulated nitric oxide, interleukin 6, interleukin 8, prostaglandin E2, and a few more tissue-destructive immune chemicals which are the causative factors behind the destructive process of both the above-mentioned forms of Arthritis. Curcumin is considered an excellent natural remedy for Arthritis and joint pains. The effectiveness of Curcumin in managing inflammatory disorders and painful joints has been proven to a great extent in several scientific and clinical studies which have been carried out over the last few decades. Most of these studies have focused on the potential of Curcumin for treating a number of pathological conditions. 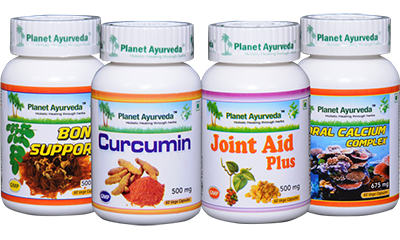 Curcumin Capsules of Planet Ayurveda are packed with standardized extract of Curcumin, a principal compound of turmeric. The benefits of Turmeric/Curcumin have also been noted for bringing about a potential reduction in the subjective experience of pain in muscular disorders and some other diseases. A few studies have also evaluated the effectiveness of turmeric extracts in treating musculoskeletal diseases. In the last few years, there can been an appreciable increase in the use of Curcumin/Turmeric for providing relief to patients suffering from various ailments, including chromic and long-term diseases. The efficacy of Turmeric has especially been noteworthy in relieving joint pains and Arthritis. 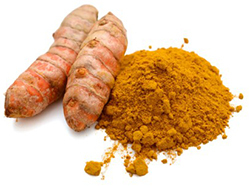 Newer formulations of Curcumin are being developed for treating Arthritis. Curcumin contains antioxidants in a large amount which are very helpful to the body in relieving itself of free radical molecules --- the perceived mechanism behind aging, Arthritis, joint pains and several diseases. Curcumin also keeps destructive inflammatory chemicals in check. In addition, Curcumin has proven ability to stimulate the growth of healthy replacement tissue and to stir up a process known as 'chondrogenesis' which facilitates the rebuilding of joints in conditions like Rheumatoid Arthritis and Osteoarthritis.